Run the Board Office Add-ins setup program and follow the on-screen instructions. During the installation process, the installer program verifies that the necessary software prerequisites are installed. The Board Add-ins for MS-Office can't be installed on MS-Office 2003, MS-Office XP. The Microsoft Office editions for Macintosh are not supported either. Select the desired Add-ins and continue. 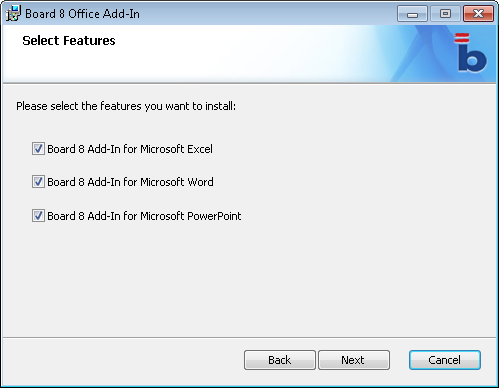 To verify that the installation has been successfully completed, open the MS-Office programs for which the Add-ins were installed and verify that the Ribbon bar contains a tab named "Board". Note that the first time you run an Office program after having installed the Board Add-in, the program may take a few minutes to open. The following illustration shows Microsoft Word with the Board Add-in installed. Note that sometimes when opening an MS-Office program, after having installed the Board Add-ins, the tab for the Board Add-in may not automatically appear. it may be necessary to enable the Board add-in in your Office program. Refer to the Microsoft documentation http://office.microsoft.com/en-us/help/HA100341271033.aspx .